After a full, happy life together, John has lost the love of his life, Alice. It's hard for him to imagine going on without her. But when his three grandchildren return home to say goodbye to their grandmother, and to comfort Grandpa John, he realizes that they need him to stick around a bit longer to help them remember who they are and what's important in life. 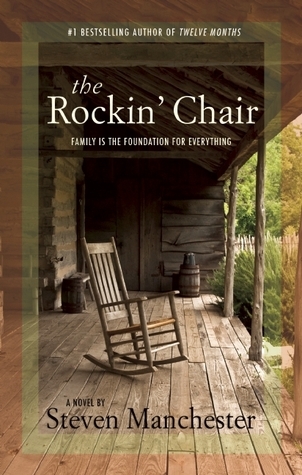 The Rockin' Chair by Steven Manchester is Grandpa John's story, but it is also the story of his son, Hank, daughter-in-law, Elle, and his grandchildren George, Evan and Tara. We hear all of their voices and perspectives throughout the story, so we get to know their thoughts and feelings as well. Each individual in this family is facing his or her own demons, and Grandpa John is the only one who can help them. As the family gathers on the farm where they all grew up, he spends time with each one, helping them to see the truth and overcome their unique challenges. He offers the wisdom and faith they need to heal. This is a heartfelt, emotional family drama about memories and forgiveness and the importance of family. If you enjoy contemporary and women's fiction, I think you'll enjoy this one. It's a bit predictable in some aspects, but quite uplifting in the end. It would make a nice summer read. This review was written based on a copy of The Rockin' Chair that I received from the author in exchange for an honest review. This looks really good - love the synopsis and a great cover! It was a really nice story. And I agree about the cover. It fits perfectly with the storyline.